Results: do you or would you use a tablet for actual work? Tablets are mostly good for reading documents, and a far better solution for that than laptops IMO. Also, the iPad pro is a great note taking device, so it can replace a notebook. I just bought a tablet (my first tablet) because it weighs 1/4 of what my laptop weighs and it's a lot smaller; it's what I'll use when I'm out and about. I will only be writing on it; my work isn't resource intensive. Let's be honest though: I mainly have it so i can play games or watch something on it while doing work on my laptop at home. The surface Pro is great for actual work, and not just media consumption like ARM tablets. This is a reply to no.3 The iPad Pro with iOS 11 would also become a great tablet for that 'actual work'. It cannot quite match the productivity of a laptop, but it's coming quite close. Personally, I would be okay with replacing my windows laptop (touch) with the new iPad Pro, the keyboard, and the Pencil. I can do ALL of my daily tasks on the iPad such as creating and editing documents, presentations, charts, and tables (with iOS 11). As well as have a beast machine for games and multimedia; in these two regards, the iPad just obliterates my windows laptop as it doesn't have quite powerful CPU/GPU. I won't be able to play desktop games but that's fine with me. See? All ARM tablets aren't bad at productivity. I've got an iPad Air 2 for work, and it's pretty useless for that. It's good for multimedia. 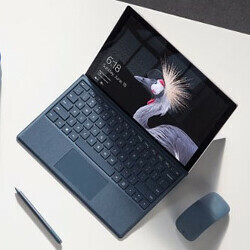 Can't come close to a Surface Pro. That's your opinion and perception. In my case, an iPad Pro with iOS 11 can replace a windows laptop of similar price. Yes I do want too and I already do. In my work I load a floorplan onto the display. not having a keyboard I cant remove made laptops terrible for my job. SO I started first with 2-N-1's where you could flip the keyboard underneath. But these options are still heavy. I did try one with a detectable keyboard, and that was better. For my work in walking in some cases location that are millions of square feet, to be able to carry a very light device, with Windows and true multi-tasking, I can switch to notepad make notes and write and make notations on floorplans and immediately email them to clients for info right while i am onsite. Marking Wifi locations, cameras, traffic counters, the route for the cabling and more on a tablet makes it easy. Single form factor devices are better for lots of reasons. They are just as good as their laptop or desktop counterparts. But software is the key. For me I want the ability to use one of 2 apps that do most of what I need vs having multiple apps that only accomplish one or 2 things. SO the platform is a big deal. Sorry Android and iOS on tablets is garbage for the work I have to do. I have to have Windows. For one it insures 100% compatibility with clients. Because I need access to specific applications not available on Android or iOS. Like Microsoft Visio. @PrYmCHGOan. Why are not using your techiexp1969 account? They didn't ban that account did they? #13 Lol good observation I didn't even realize that, but this post has correct spelling and grammar so I'm not sure if it's Techie. It honestly depends on what you need to do. I work in Project Management and use a ton of web based tools. I can do all of my work on a Chromebook and be fine, so using something like an iPad Pro would work fine. If you do something like web development, 3d modelling, database work, well... probably not. Strike - Tablets are not useless. They all have their place. ARM based tablets are great for chilling and watching a movie. You can do "some" productivity and for those who can live within the limits of them, its fine. But I can't. I have to be able to have access to real apps. I can't used trim down versions. Example - We have apps we wrote in-house for Android and Windows, that we can't write for IOS, because apple doesn't allow API access to much of the hardware. So for example, when I walk the mall, the celing heights change often. With the app we made, we can point the camera at an object on the ceiling and get a fairly accurate measurement of how high this is, especially during hours when lifts are not allowed to be used. We cant do this in iOS because the Camera API doesn't allow access to the camera equally to provide the code needed for such. Software compatibility is a huge issue. For one desktop versions of Office have everything while mobile versions do not. Even if you pay a subscription for mobile Office, many features are still not available. Many of our clients create very special documents that have formulas and special macros that mobile apps can't use or won't have. Each as hardware as their weakness and strengths, but the software is what can make them most apparent or hidden. I have seen ARM tablets used in a variety of ways. Like in hospitals, restaurants and more. Many places are using tablets as POS equipment, educational devices and more. They are small, light, easy to handle and offer many of the benefits of a laptop, without all the excess physical size and weight. I have just started using my iPad Air 2 on a pretty much full time basis. Can't wait for the new update. I'd say it does about 90% of what my MacBook or work Lenovo does- often times, much faster too. MS support for the iPad is outstanding and even apples own office suite is pretty good too. I do use a Belkin Ultimate keyboard though which is by far the best keyboard I've tried. I think I will be upgrading to the new iPad come the end of the year though. The iPad Air 2 to me was the best Ioad model. God knows i hate I gave it up to get a Pro. What a idiot. iPad breaks when you drop it. They should report this on the world news. Glass will break if you drop it. "Actual work" means a professional uses a device for what he has to do. Let's think about journalists/bloggers: can they write article and publish them on their site/blog, can they life stream interviews? Sure they can. Let's think about salesmen: can they make presentations otg, respond to emails, make conference calls, using tablets? Sure they can (they can even use smartphones). Let's think about protection companies: can they check the cameras in an area, can they have real time alerts from the sensors and trigger alarms? I think they also can. So there are a lot of PRO case scenarios where a tablet can be used for "actual work".